NSFA, Panacan, Davao City - With the start of a new year, the Commander of Eastern Mindanao Command (EMC), Lt. General Benjamin R. Madrigal, Jr., has directed all military units in Eastern Mindanao to resume the conduct of proactive measures to protect communities from harassment of NPA Terrorists, after the termination of the Suspension of Military Operations (SOMO) on January 2, 2018. It can be noted that President Rodrigo Roa Duterte has declared unilateral ceasefire that took effect at 6:00 p.m. on December 23, 2017, until 11:59 p.m. on December 26, 2017, and resumed at 6:00 p.m. on December 30, 2017 until 11:59 p.m. on January 2, 2018. While the Government is implementing SOMO, the NPAs on December 25, 2017, attempted to abduct CAA Arbilito A. Catampao at Sitio Madian, Brgy. Tubaon, Tarragona, Davao Oriental. On a separate occasion, a CAA Patrol Base in Brgy. 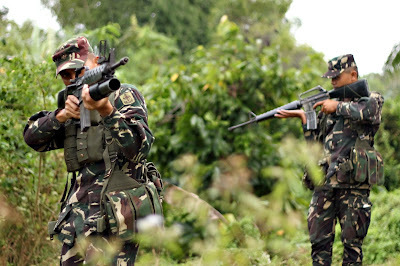 Melale, Laak, Compostela Valley Province was also harassed by an undetermined number of NPA Terrorists during the suspension. On December 23, 2017, around 11:00 p.m., NPA terrorists ransacked houses and took over the whole Purok of Sitio Mabugnao, Barangay Las Arenas of Pantukan which prompted 66IB to respond and prevented further NPA atrocities thereat. Also on January 02, 2018 at 2:20 p.m. and 6:40 p.m., NPAs harassed two units of Philippine Army stationed at Brgy Panansalan, Compostela and Brgy Cabuyan, Mabini, both in Compostela Valley, prior to the termination of SOMO. Lt. Gen. Madrigal said that these were committed by the NPAs while the EMC units on the ground have strictly followed the SOMO to give all Filipinos the time, including the NPAs to spend the holidays with their families without fear. He likewise ensured the public of the sustained conduct of Community Support Program in the different far-flung communities in Eastern Mindanao. "Our efforts on assisting other line government agencies in facilitating the delivery of government services in the geographically isolated and disadvantaged areas (GIDA) must also continue and be pursued," he emphasized. Meanwhile, EMC units were tasked to assist Local Government Units and other pertinent government agencies on the conduct of Humanitarian Assistance and Disaster Response, in view of the damages brought about by Tropical Storm Vinta and TD Agaton.